Mediation is an alternative method of dispute resolution available to parties undergoing separation or divorce. The primary method of dispute resolution has been litigation, in which the separating or divorcing parties are adversaries and a judge or master makes the decisions for the parties. Mediation is different because the parties work together to decide between themselves what is best for them and their children. The mediator is not a judge, but helps the parties to decide, on their own, how to resolve their differences. For more information on the benefits of mediation, please visit MACRO - Maryland�s Mediation and Conflict Resolution Office. Mediation may be ordered by the court or it may be voluntary. Court-ordered mediation takes place when the case has already reached court, and is governed by specific rules of the court. In court-ordered mediation, the parties may only discuss custody and visitation, unless they agree to discuss other matters. Also, there is a limit to how many mediation sessions may be ordered by the court. For example, the court might require one or two sessions. Mediation may continue for more sessions only if the parties both agree to more sessions. Voluntary mediation is selected by the parties on their own prior to, during, or after, the case goes to court. Voluntary mediation is not restricted by rules of the court, but by the wishes of the parties involved and their mediator's guidance. In voluntary mediation, the parties may work out any and all issues pertaining to themselves and their children, including issues of support and property distribution, in as much time as needed. The manner in which child custody cases are generally handled through the court system is truly amazing and quite disheartening. By comparison, so little time, money and effort is spent on efforts to resolve issues between parents that affect the lives of their children through win-win solution-oriented methods such as mediation. Often parties will spend thousands and tens of thousands of dollars and more fighting about almost anything, and usually everything, attempting to make the other parent "look bad" while casting him or herself in the most favorable light possible to the court. Although the Court cannot simply budget and manage multiple mediation sessions, there should at least be a moral requirement of all parents entering custody litigation to take some of that otherwise negative energy, emotion and attorney's fees and invest it in mediation for as long as it takes to begin to reach some resolutions. Generally, even when a judge decides custody and visitation issues, he or she does not get involved in the intricacies of planning holiday schedules, vacation schedules and the like. Often after residential schedules are established, these types of "lesser" matters are the only things left to the parents to resolve from that point forward. Unfortunately, in the aftermath of custody litigation, they are often unable to agree on anything, and the reality is that every time there is an opportunity for disagreement --- there is disagreement. Therefore, even if the parents cannot agree on the ultimate residential schedule and legal issues pertaining to raising their children, it certainly would be beneficial to them to submit to the court a mediated agreement that outlines the way the parties and the children will spend their holidays, vacations, extra curricular activities, sports involvement and the like. Additionally, Courts would have much greater respect for the parents and look at them much more favorably. Often the usual interpretation of the Courts is that "these two parents can't even get along well enough to resolve issues about their own children, and they want me [the Judge] to decide their fate for them." It just doesn't make sense, does it? The best advice anyone can give a parent that goes through custody/visitation litigation is to put as much effort as possible into resolving any issues that can be resolved, no matter how small they may seem in the scheme of things. It's like eating an elephant. No matter how difficult the task may seem, it can only be accomplished one bite at a time. Parents need to learn to reach decisions, even if minor, and build trust, and move on. Through mediation, the parties are directly involved in making decisions for and about themselves and their children, unlike when parties take the case to court. In court, a judge or master decides the outcome for the parties according to the law and the facts presented. Since judges are restricted as to what the law allows them to do, both parties may find themselves unhappy with the judge's decision. When working through mediation rather than the court, the ability for the parties to work through their problems without being bound by rules of the court allows more freedom to satisfy everyone concerned. The parties may also be more inclined to abide by an agreement that they have reached together, rather than terms which have been forced upon them by the court. Sometimes, people try to solve future problems by following the patterns set when they first separated or divorced. If the parties litigated their differences initially, they are more likely to approach future problems in the same way. If the parties resolve their differences through mediation and cooperation from the very beginning, they will most likely cooperate to resolve any other issues that may arise. If you think there are trust problems before the Court case, just wait until after one or both parents feel aggrieved by the process and are shocked by the way the other parent "lied" in public, under oath, about virtually everything that took place. It is all too common and is all avoidable. However, it does take both parties to be mature enough to realize the importance of working through the mediation process in order to work things out amicably. It is indeed a process, and to expect long-term feelings of anger, hatred, distrust and fear of the unknown to be resolved in two court-ordered mediation sessions is often unrealistic. It is too easy for people to say that "we tried mediation" and it didn't work. Mediation should be "tried until it works." The end result could save you a lifetime of agony and your children will thank you later in life. Court-ordered mediation often begins after a custody complaint is filed in the court system. The mediator for the parties is appointed by the court from a list of qualified mediators. For voluntary mediation, the parties begin by locating a mediator and making an appointment. A mediator is a professional who is trained in helping people resolve disputes. Attorneys, mental health professionals and other divorcing couples may be good sources to consult when looking for a qualified mediator. A mediator is a neutral person who helps all parties to become informed about each other's needs and interests while gathering information that will be useful in developing agreements that are voluntary and designed to meet the goals and serve the interests of everyone involved. While the goal of mediation is to reach a fair agreement, participants are always in control of the mediation process, in that they can end the mediation any time and there is no undue pressure from the mediator to reach an agreement. The mediator is a person who has been trained to help participants identify issues, create an orderly program for exploring interests, facilitate problem-solving, and to keep negotiation on track. The mediator does not make any judgments regarding the substance of the dispute or any possible resolution. The mediator does not give legal advice. The participants should consult their own counsel to assess the merits of legal or other issues. The mediator does insist, however, that the integrity of the mediation process is never violated, and will deter any abuse of the process that comes to his or her attention. The mediator seeks to give the participants the means to solve problems on their own without the need for judges and other authorities to make the decisions. The mediation process empowers parties to solve problems themselves. Often in court-ordered mediation, each party is required to be represented by an attorney. In voluntary mediation, each party has the right to decide whether to be represented by an attorney. However, some private mediators may request that the parties each engage attorneys to represent them in finalizing any mediated agreement(s). Parties need to embrace the mediation process and make efforts to reach agreements that are truly their own. Often it is advisable to have your attorney review a proposed mediated agreement or memorandum of intent prepared by a mediator. However, if you were satisfied with the terms of the mediated agreement, you should not simply be swayed to "not agree" because your lawyer thinks you can do better in court. He or she may be confident, but may be mistaken, and Court is about as unpredictable as the lottery in many cases. Often too, once the power struggle is resolved by mutual agreement, it is less likely to continue and there is more likely to be give and take by both parties, which is essential when raising children. It is unfortunate, but some attorneys do not understand the value and importance of mediation and the positive long-term effects of the process, and hinder the possibility of cases being resolved in an amicable fashion. Do not let your attorney simply throw fuel on the fire. If that happens, your attorney's fees will certainly reflect it. The cost of mediation often depends upon the specific type of mediation. The cost of court-ordered mediation may be waived by the court, or the court may order either party to pay the entire cost of mediation or order both parties to share the cost. The parties will also incur the cost of representation by their individual attorneys. In voluntary mediation, the parties are responsible for mediation expenses themselves. Since there is no limit on the number of mediation sessions, as in court-ordered mediation, voluntary mediation may result in a greater expense to both parties. Mediation costs are usually based on an hourly rate or a flat fee, depending upon the contract between the parties and the mediator. Although there is a cost for mediation, it is far more than likely that the overall cost of the separation or divorce will be less expensive if pursued through mediation than through litigation. The goal of mediation is to reach a satisfactory agreement on the topics which brought the parties to mediation in the first place. With court-ordered mediation, the topics are restricted to custody and visitation unless both parties agree to include other issues. The parties may choose to discuss the children's living arrangements, the children's need to spend quality time with each parent and the parent's schedules. In voluntary mediation, any and all topics which are important to the parties are open for discussion. For example, custody and visitation, the disposition of property, each party's income and expenses, alimony, child support and life insurance and health insurance may be discussed. With court-ordered mediation, the mediator must prepare a written draft of the agreement and send copies of the agreement to the parties and their attorneys. The agreement may be approved or modified by the parties. The mediator then submits the agreement to the court for approval and entry as an order. With voluntary mediation, the private mediator may prepare an agreement. Before a private mediation agreement is signed, it should be reviewed by each party with his or her attorney. If corrections or changes are needed and both parties agree, then the changes may be made. This agreement may take effect immediately and govern the parties until they decide to divorce. At that time, the agreement may be incorporated into the divorce decree. The success of court-ordered or voluntary mediation depends upon the ability of both parties to work together rationally to find a satisfactory solution to problems arising from divorce and custody disputes. Since not everyone is able to cooperate in such disputes, the Maryland Legislature has provided that the court may not order mediation in any case where there is a genuine threat of physical or sexual abuse of one of the parties to the parties' children. It should also be noted that in custody litigation there are often general claims of abuse, mental cruelty and the like, and quite often things are generally exaggerated ten-fold in an effort to make one of the parents look "bad" in the eyes of the court, etc. Any true and genuine fears of physical or sexual abuse occurring in mediation should, in actuality, be slim to none. Let's face it, mediation will be taking place generally in an office setting, with other people around, and the parties are presumably coming to mediation in an effort to resolve differences. Any real or perceived fear should be substantially less than what would have otherwise occurred in the past when the parties were left to their own devices in dealing with disputes without professional intervention. Far too often, one or the other parties may use fear as a convenient excuse not to engage in the mediation process. Generally, the greater fear should be of what can happen in a court room, with respect to your children's future, if efforts to resolve parental differences result in contested custody litigation. Remember, anything that occurs in mediation (other than threats or violations of the law) is not admissible in court under any circumstances. Therefore, parties have incentive to speak openly and honestly without fear of losing tactical ground, as may otherwise be the case in litigation. While mediators set parameters and guidelines for effective communication, and demand an environment of mutual respect and a certain amount of human courtesy, often a skilled mediator will let the parties "vent" to a certain degree since being able to express one's anger and frustration is often a precursor to reasonableness. Although mediation may not be for everyone and it may not resolve every parental dispute, it is hard to come up with any reasons for not fully embracing the mediation process and trying to resolve matters in an amicable fashion that effect the future of your children and your ability to move on with your life. When you put the past behind you, the future opens to brighter opportunities for you and your children. Preserving parent-child relationships one separation and divorce at a time! As a family law attorney, collaborative practitioner and mediator I can help you find acceptable out of court solutions to many of your separation and divorce related issues. Law Office of Michael A. Mastracci, LLC. Mediation with Mike Mastracci, also known as "Mike the Lawyer" from Catonsville, Maryland just outside Baltimore is a unique experience that is sure to assist you in resolving any issues surrounding separation and divorce such as: child custody, visitation and child access, use and possession of the marital home, child support, spousal support, alimony, co-parenting plans and child residential schedules, shared custody, joint legal custody and everything in between. When Mike says, "I know how you feel" he means it. His personal and professional experiences with moderate to high conflict divorce and child custody issues has resulted in a solution oriented step by step approach to helping couples reach short and long term agreements that they are likely to keep. Mike offers ongoing post-mediation "maintenance" services with an open door return as needed policy at discounted rates. 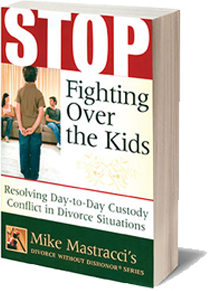 Mike is the author of the award winning and widely acclaimed book: Stop Fighting Over the Kids, Resolving Day-to-Day Custody Conflict in Divorce Situations, which is available on Amazon and Kindle. After Mike's own gut wrenching divorce and child custody battle he founded and operated Maryland's first full service Child Access Center in the 1990's. The Child Access Center, Inc. handled hundreds of monitored child exchanges for high conflict couples, provided supervised visitation services, custody evaluations, expert testimony, mediation, co-parenting seminars and the like. Mike recognizes that like separation and divorce, mediation itself can be difficult. While mediation is not always be an easy solution, it sure beats the alternative of litigation. A skilled and effective mediator should not only expect people to be at their worst during acrimonious, emotionally charged situations such as divorce and child custody disputes but he should be able to deal with it in a way that allows both parties to recognize that mediation is not just a forum for making short term agreements but a therapeutic environment to set the stage for meaningful long-term change. Mike takes it far beyond the "nice-nice" & "I hear what you are saying" & let's play simple "re-framing" & "I messages" and the like. While many such techniques are useful, sometimes you just have to roll up the sleeves, say what you mean however you need to say it and get down to real business in real life terms. People come to mediation in different places along the separation process; some are more ready than others.... for better or for worse. Mediation is not a one size and one technique fits all panacea and Mike will adapt to your situation with understanding, respect and compassion and a dose of hard-core reality from time to time. Mike has an extensive referral network for families in transition. If Mike the Mediator can't help you resolve your divorce and child related issues, then you are really in for a rough road ahead. All cases settle one way or another; so choose the right path today, before it is too late. Mike regularly provides Mediation in Baltimore County, Baltimore City, Howard County, Ann Arundel County and Harford County. Mastracci�s new service is designed to help couples deal with co- parenting child access and child custody issues. These services are primarily offered to individuals who are in litigation, mediation, or attorney negotiation stages and who are unable to reach resolution because of one or two issues that are presenting as roadblocks. Impasse Intervention Services (IIS) is a unique, brief problem solving process that focuses specifically on the one or two issues that are resulting in an impasse. While this service is not designed for global resolution it is ideal for identifying and appropriately dealing with obstacles to settlement and resolving those one or two issues so that mediation or attorney negotiation can resume and a court trial can avoided. In appropriate circumstances Mastracci will offer his time, talents, skills and experience in the area of conflict resolution under the IIS model on a flat fee basis! Imagine paying just one flat fee per issue(s) and having a skilled attorney, mediator, and collaborative practitioner at your collective service in joint meetings and phone conferences until any given issue is resolved or until you and the other parent admit defeat. Together we can solve your child related issues before, during and after separation and divorce, one issue at a time. REMOTE MEDIATION � a new service with practical results and better than being there! We can mediate all of your issues remotely (one-on-one phone calls, conference calls, email, Skype, video conferencing) without ever needing to have all parties in the same room. It does not matter if you and the other party reside in the same city, town or state. Remote mediation allows ease of scheduling, less time off from work as well as evening and weekend phone sessions and it is generally less expensive than �in office� mediation. To learn about this service, please give me a call to arrange a fifteen (15) minute complimentary mediation consultation with both parties on the line. A mediator is a neutral third party who does not represent either participant in the dispute(s). The mediator helps to facilitate positive communication between the parties so that they can come up with their own solutions to their unique situation. The mediator does not give legal advice but may offer a great deal of practical advice and insight. Mediation is generally far less expensive than contested litigation and simply makes sense regardless of the circumstances. Remote mediation fees are equally split between the parties and typically average $150.00 an hour per side with a (3) three hour retainer required. My goal is to help people through mediation to resolve their differences in a private and confidential manner that takes into account the needs of all concerned. It does not matter if they are already in litigation, have retained lawyers or are just starting the process on their own. There are no winners in contested litigation. I respectfully suggest that if at all possible you need to take control of your own destiny rather than turning your future to a stranger in black robe and wasting possibly tens of thousands of dollars to get there. My unique skill set and compliment of mediation services might be just what you need. I have an effective style and approach in order to cut though the things that often hold back a settlement from occurring. Whether attempting to mediate the entire case, utilizing impasse intervention services, neutral case evaluation methods, or simply dealing with a few issues that get in the way of progress; together we can get it done. I offer one on one private phone calls, conference calls and Skype /video conferencing services. I will explore the dynamics of the communication issues so the together we can improve the interaction between you and the other party. If you have an attorney representing you, please discuss this mediation option with him or her and if your attorney is opposed to this process you might want to strongly consider whose interests your attorney is really most concerned about. I have been handling contested litigation cases for (30) thirty years. Except for rare circumstances I no longer accept contested divorce and child custody cases; they just don�t make sense. Nearly (20) twenty years ago I was a founding member of the Maryland Collaborative Law Association (MCLA) and started concentrating on ways to resolve cases without judicial intervention. I have also been a practicing mediator for over (20) twenty years and founded Maryland�s first and only Child Access Center. If you have not heard of Collaborative Law, please visit www.collaborativepractice.com. There are many times when a mediator can be part of the settlement process even when both sides have attorneys. In the mid 1990�s I went through my own divorce and child custody battle that lasted for several years. It wiped me out. So, when I say, �I know how you feel� I mean it. If children are involved call me to obtain a complimentary copy of my award-winning book, Stop Fighting Over the Kids: Resolving Day-to-Day Custody Conflict in Divorce Situations. I strongly urge you to share this information with the other party and contact me for a no-charge phone consultation so that I can answer any questions either of you may have. I hope to hear from you soon.